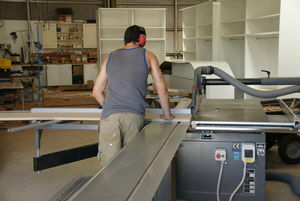 NKR Custom Designed Kitchens began over 20 years ago as Nathalia Kitchens and Renovations. Over this period our reputation of providing quality workmanship has resulted in many repeat clients in the Nathalia, Numurkah, Shepparton Cobram Yarrawonga and surrounding areas and we are pleased to look to the future and continue to provide this service. Being an owner/operator we can provide you with individualized attention and attend to all your queries as they arise. Our Vision is to provide custom designed kitchens, bathrooms, laundries, wardrobes, office/reception joinery and furniture of the highest possible quality. We endeavour to always exceed customer expectations and hope that our dedication to excellence and friendly professional service will result in repeat customers in the years to come. Our mission is to provide unsurpassed quality workmanship and service and ensure that customer satisfaction is a top priority.